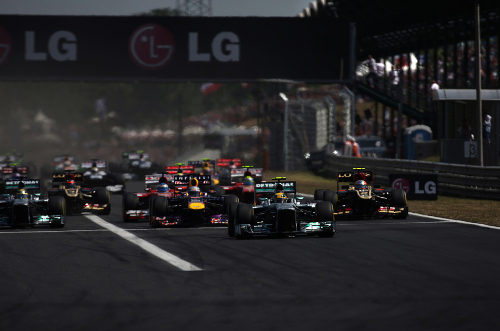 The unexpected one won the Hungarian Grand Prix. After earning the pole in his Mercedes on Saturday, Lewis Hamilton didn't have high hopes of being at the front of the pack when the race ended Sunday. "It's great to have pole but doesn't mean much for the race," he said on Saturday. "It will be tough tomorrow and that is the way it is. It is a shame that we have got a good car, and if we didn't have a tire issue we would be able to compete. We will do the best we can tomorrow. We will just try and get as many points as we can." As a punishment for its semi-secret private Pirelli test, Mercedes had been banned from the recent young driver test at Silverstone where the other teams got to try out the new Pirelli tires that will be used for the rest of the season. So Mercedes, which had problems getting the previous versions of the tires to perform well over a race distance, didn't know what to expect on a hot race day afternoon in Hungary where the track temperatures exceeded 122 degrees Fahrenheit/50 degrees Centigrade. Hamilton led four times and a total of 48 of the races 70 laps including the final 15 to win his first race in the Silver Arrows Mercedes. "I came here saying and praying that when we put on these tires that they would come towards us more than away from us and it seems like they've done that," he said. "For a team that really struggles with tire degradation today was a walk in the park. I'm really baffled." After winning the pole for the 30th time in his career, Hamilton took the lead at the start of the race ahead of Sebastian Vettel (Red Bull) and Romain Grosjean (Lotus.) The top eight on the grid started with Pirelli's soft compound slick, so pit stops were soon to be in order. Hamilton stopped after eight laps and handed the lead to Vettel who led for two laps and then pitted giving Grosjean first place for three laps. The series of events around those pit stops determined the outcome of the race. Hamilton emerged back on the track behind Jenson Button who had started with the medium compound Pirellis on his McLaren and was therefore on a longer stint. Hamilton swopped by Button. But when Vettel came up behind Button he got stuck there for 10 laps. That allowed Hamilton to pull out a gap on Vettel. To make matters worse, Vettel damaged his front wing trying to pass Button, and the loss in downforce cost him almost half a second a lap from then on. "The key issue in the race was when I got stuck behind Jenson, there's no one to blame for that," Vettel said. "I lost more time than expected on the way into the first stop and we came out just behind him. I couldn't get past; I tried to force it and damaged my front wing, which was a mistake from my side. I was maybe trying to urge a bit too much." Meanwhile, Mark Webber, who had qualified 10th and started on the medium tires, made his way up to first on lap 14 as the drivers on the softs pitted. He led until making his first stop on lap 23. Hamilton led laps 24 to 31 until his second stop. Vettel led three tours and pitted and handed the lead back to Hamilton. Twice Hamilton came out of the pits behind Webber, and twice he immediately passed the Red Bull driver in Turn 3. "I think you could tell I was hungry for it today," Hamilton said. "I was just going all-out. I needed to get past those people and usually I get stuck in traffic, generally in my races, and today I wasn't having it. I was going for every move I had." Hamilton led laps 35 to 50 before making his final stop. That left Vettel in front for five laps and then he made his last visit to the pits. And Hamilton took over the lead on lap 56 and he had a comfortable 10 second gap over Kimi Raikkonen (Lotus) who was battling with Vettel for second place. Raikkonen, who qualified sixth, was on a two-stop strategy while the other front runners pitted three times for tires. "I knew it was going to be a bit tight but I felt that the tires were good still in the last ten laps," he said. "So maybe last two laps they drop off quite badly but I didn't really have any doubts that I couldn't keep him behind. I had good speed through the last sector so I knew that in the first corner they will not have a chance. Obviously you take a chance always when you make so many laps with a set of tires - but the team worked well, everything worked well for us. Unfortunately yesterday wasn't an easy day so otherwise we could probably have fight for a win." Vettel attacked Raikkonen but couldn't get by. "Very close with Kimi in the end but as he mentioned, he was very quick through the last two corners and then I couldn't really get him on the straight," Vettel said. "So yeah, I did all we could but surely wanted a little bit more today." At one stage of the battle Vettel yelled over the radio that Raikkonen had not left him enough room at turn four. "I told him (after the race) but he was laughing only," Vettel said. "It was fine. Obviously in the heat of the moment it was quite tight getting into there. I tried to prepare the next corner but nearly lost the car. That's racing." If it had not been for the mechanical problems Webber had on his Red Bull in qualifying he would have been involved in the contest for the podium. Starting 10th, he chose a reverse strategy to the front runners and used the medium tires for his first three stints and then pitted for the soft tires with 10 laps to go. "I think we had the right strategy," said Webber who set the fastest lap of the race. "We knew there was a lot of pressure on getting a good first lap and I got some clear air, which worked well. The start was okay and the first sector was very good, I was able to put a bit of pressure on Kimi and then we just settled in. I had a pretty tricky car for the first three or four laps, as I knew the option tires were quite grippy and after that we just got our heads down. I don't think we could have got much more than that result today. The strategy was pretty solid and you have to pace the option tires until the end." Fernando Alonso started fifth and finished fifth in the Ferrari. "Maybe we actually did better than what should have been within our grasp," he said, "because Mercedes, Lotus and Red Bull were quicker than us, a fact we had already seen from Friday's practice. This race ends what's been a generally difficult month for us and, with Silverstone and Nurburgring, is part of a cycle where we were not up to par. However, looking at the points we have obtained, we haven't lost out too much and today, Hamilton and Raikkonen helped us to keep the gap from growing too big to Vettel in the lead." Grosjean had an eventful afternoon on his way to finishing sixth. Race officials gave him a questionable drive through the pits penalty for going off the track while passing Felipe Massa. And after the race the officials docked Grosjean 20 seconds for causing a collision with Button. Despite the penalty Grosjean held on to sixth place because he had crossed the finish line more than 20 seconds ahead of Button who wound up seventh. "For sure this is one that got away," Grosjean said, "but I'm very happy with my race and I honestly don't think I could have done much more. Maybe the strategy didn't quite work how we wanted, but the car felt really good and it was the traffic that cost us. Without this maybe there would never have been a drive-through penalty which for sure didn't help. I haven't seen the footage yet and I thought it was a good move, but unfortunately the stewards took a different view. I've no problem with the time-added for the incident with Jenson and I apologized to him afterwards. This could have been the one for me, but we will just have to wait a little bit longer and keep improving like we have been recently to make it happen." Like Raikkonen, Button opted for a two stop strategy. "That was a fun race," Button said, "although I seemed to be a target for other cars! Sebastian (Vettel) tried many times to get past me, and clipped my rear wheel into Turn Two. He may have damaged his wing, but I was lucky not to puncture. With Romain (Grosjean), I don't know what he thought. Unless I took to the grass, it was inevitable we were going to touch! I don't think he was thinking at that point. I ran almost half the race on the Prime tire, which was the longest of anybody; it's good to show we can do that. Our middle-stint pace on the Option was also very good, and I had a blinding first lap, jumping from 13th to eighth. We beat a Ferrari fair and square, and we'd also have beaten a Mercedes if Nico (Rosberg) hadn't stopped - we can take a lot of positives away from here." Massa (Ferrari), Sergio Perez (McLaren) and Pastor Maldonado (Williams) rounded out the top 10. Rosberg had been running in ninth place but his Mercedes engine blew up with just six laps to go. His retirement elevated Maldonado to 10th and thus Williams scored its first point of the season. "I had a really good start from P15 and made a few overtaking maneuvers during the race which were on the limit, which is especially pleasing as at this track it is very hard to overtake," Maldonado said. "The car felt consistent, maybe not as fast in the second and third stints, but very consistent. I really want to keep scoring points now and be even stronger during the second part of the season." Happiest of all was Hamilton - the unexpected winner. "It's been a great weekend, really a great weekend," he said. "Really didn't expect it coming in!"